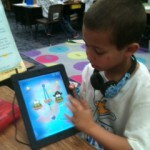 How do first graders learn to solve problems and create inventions? Through science, social studies, reading, and their iPads of course! Mrs. Fetner’s 1st grade class at Speegleville Elementary has been exploring inventors (Ben Franklin, Garret Morgan, and Alex G. Bell) and their inventions. The journey begins with students reading Meet Ben Franklin in their textbook. Next, class discussion explores how scientists are curious (like students) and ask a lot of questions (like students). The discussion also includes what a problem is, how scientists think of problems, and ways to solve them. After understanding what a problem is, students move to practicing how to solve problems with Apps such as Where’s My Water? (CLICK HERE for app download), Monster Physics Lite (CLICK HERE for app download) and the Cut the Rope series (Cut the Rope; Cut the Rope: Experiments; Cut the Rope: Time Travel). 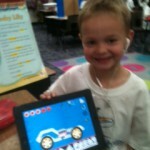 Students next discover how to create an invention by using the Car Constructor App (CLICK HERE for app download). Once they understand this concept, the teacher and students brainstorm a list of problems they see in the classroom, city, world, etc. Students are then challenged to choose one of the problems and to create an invention to solve that problem. Through the entire process, students write about their thoughts and ideas through journaling using Apps like Kid’s Journal (CLICK HERE for app download). The project concludes with students creating a model of their invention by using items such as paper plates, paper cups, pieces of yarn, bits of foil, popsicle sticks, etc. What will they invent next? 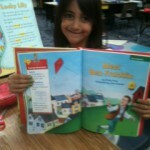 Student reading the Meet Ben Franklin story. 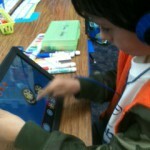 Problem solving with Cut the Rope Time Travel. Problem solving with Monster Physics Lite.